1. 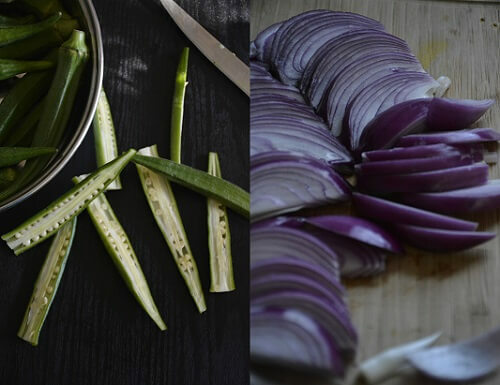 Wash, clean and wipe the okra using dry kitchen cloth, cut the head of Bhindi, and then cut them into two long slices. 2. Peel the skin of onion and chop into slices. 3. Heat the 1 tbsp oil in a pan, add sliced Bhindi and stir fry on a medium flame for 4-5 minutes, then remove from the pan into the plate and keep aside. 4. Add remaining 1tbsp oil in same pan; add mustard seeds, cumin seed; when seed popup, add pinch of hing. 5. 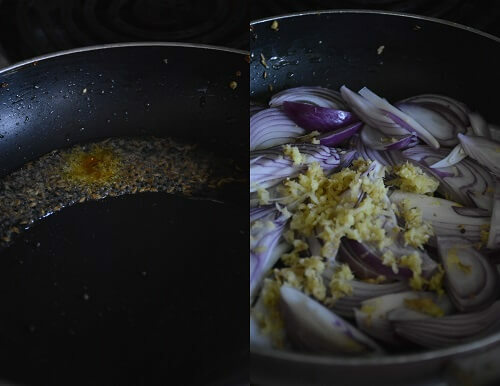 Add sliced onion, grated ginger and stir fry on a medium flame till golden brown. 6. Add already prepared Bhindi, red chili powder, turmeric powder, garam masala, coriander powder, cumin powder, dry mango powder, and then toss it and mix well. 7. Now add salt, mix it and remove it from the flame. 8. Bhindi Do Pyaza is ready to serve with fulka, roti or dal-rice as a side dish. • Bhindi tends to get sticky while cooking, to avoid that, do not cover the pan while cooking. This will help to dry out stickiness without the presence of steam. • Cook the Bhindi on medium flame with stirring for restaurant style results. • I cooked Bhindi separately without salt just to retain green color and make it crispier. Bhindi Do Pyaza is a north Indian dish. Bhindi Do Pyaza is mostly serve in restaurants or in Dhaba. 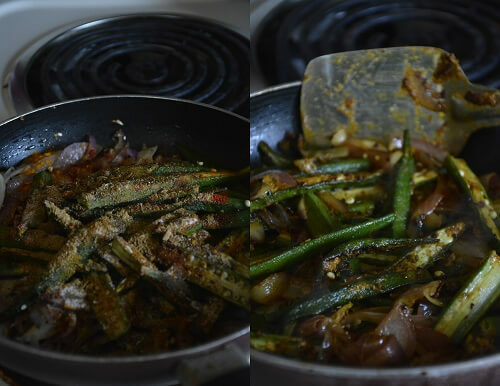 There are many different versions of making Bhindi, but Bhindi Do Pyaza is very tasty, delicious and quickest version. It’s made with double quantity of onion. 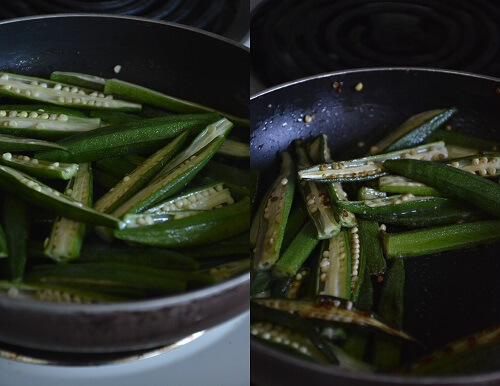 Wash, clean and wipe the okra using dry kitchen cloth, cut the head of Bhindi, and then cut them into two long slices. Peel the skin of onion and chop into slices. Heat the 1 tbsp oil in a pan, add sliced Bhindi and stir fry on a medium flame for 4-5 minutes, then remove from the pan into the plate and keep aside. Add remaining 1tbsp oil in same pan; add mustard seeds, cumin seed; when seed popup, add pinch of hing. Add sliced onion, grated ginger and stir fry on a medium flame till golden brown. Add already prepared Bhindi, red chili powder, turmeric powder, garam masala, coriander powder, cumin powder, dry mango powder, and then toss it and mix well. Now add salt, mix it and remove it from the flame. Bhindi Do Pyaza is ready to serve with fulka, roti or dal-rice as a side dish. This looks so pretty and delicious! I’ll have to pick up some okra at the market this week and give this a try. Pinned! Awsme recipe I very like it.